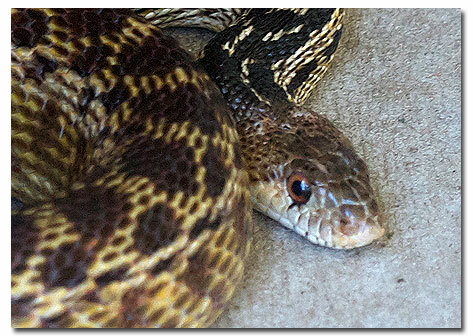 Members of the Colubridae Family, the common, large, gopher snake is usually between 36 and 96 inches long. Gopher snakes range in color from cream-yellow to green-gray to tan, with large black, brown or reddish blotches on their back and smaller ones along their sides. Most specimens have a dark line between the eyes and another from behind the eyes to the angle of the jaw. Sometimes striped individuals, with or without blotches, are found. Throughout all 4 deserts of the American Southwest and beyond, up to 8000 feet. Found in a wide variety of habitats including desert flats, coastal dunes and coniferous forests, but preferring grasslands and open brush areas. Slow-moving, the gopher snake investigates burrows, rocky crevices and even climbs trees in search of prey. Adult snakes hunt small rodents, young rabbits, lizards, birds and occasionally other snakes, usually by their sense of smell. Prey is killed by constriction and suffocation. Mainly diurnal, these cold-blooded snakes often change their activity patterns to become nocturnal during the intense heat of desert summers. They may be observed sunning on the rocks or drawing heat from the pavement during the day to ready themselves for active nights. Though predators themselves, non-venomous gopher snakes may become prey to Red-tailed Hawks, Kit Foxes or Coyotes. Alerted to danger, the snake coils up, vibrates its tail and hisses a warning (Pituophis means "phlegm serpent" in reference to this loud hiss). The hiss is produced by use of an organ in the mouth called the glottis. The glottis opens and closes rapidly, giving a fair imitation of the rattle of a rattlesnake. 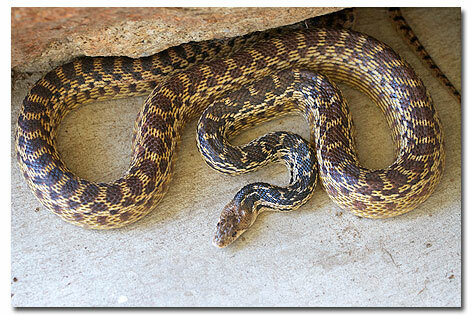 The Gopher snake can also spread and flatten its head, thereby resembling a rattler even more. An unsure predator mistakes this behavior and the somewhat triangular head of the Gopher snake for a rattlesnake and backs off from its pursuit." In Winter, gopher snakes hibernate, retreating to communal dens, sometimes sharing the lair with rattlesnakes, whipsnakes or racers. But in the breeding season, males vigorously defend their territories against all competing males. The combat "dance" between male gopher snakes, which may last up to an hour, has been mistaken for a courtship display between males and females. Head rearing, hissing, intertwining like Grecian wrestlers, and slithering along the ground with upraised heads, the combatants focus on the task at hand, oblivious even to human onlookers. Six weeks after mating, females lay a clutch of eggs with 2 to 24 eggs each. Hatchlings emerge fully developed within 10 weeks, and are large enough to eat small mice. Gopher snakes in the wild reach maturity in 3 to 4 years. Sometimes referred to as "typical snakes," the Colubrids comprise the largest snake family by far, with more than 2000 species worldwide. About 75% of California snakes are Colubrids. Although experts differ on classifications, there are 3 North American species listed for the Pituophis genus -- catenifer, deppei, melanoleucus -- with numerous subspecies, 5 in California alone. One sources refers to Pituophis catenifer affinis as the Sonoran Gopher Snake and Pituophis catenifer deserticola as the Great Basin Gopher Snake. Other subspecies of this genus are variously called pine snakes or bull snakes.